The Pocono Mountains has all the essentials for the perfect trip with your special someone. With comfortable and quiet accommodations, world-class restaurants, and a gorgeous setting, it’s easy to relax and enjoy the company of the one you love the most. Whether you’re celebrating an anniversary or taking a spur-of-the-moment trip, these activities are some of the best things to do during romantic getaways in PA! For more ideas, download our free Vacation Guide. We’ve listed even more great shops, museums, historic sites, hiking trails, and other fun attractions in the region. The Pocono Mountains region is known for its gorgeous landscape. From the flowers in the spring and summer to changing leaves in the fall and the snow-covered ground in the winter, there’s no wrong time to visit. During your getaway, consider packing a picnic lunch and exploring one of the nearby hiking trails. Bushkill Falls is an excellent choice for a waterfall hike. What’s more romantic than that? Promised Land State Park is especially gorgeous in the springtime when blooming buds border the hiking trails. If you’re interested in seeing more waterfalls, consider taking The Settlers Inn’s waterfall hike! Our sister property has created a self-guided tour that lets you see plenty of these gorgeous natural features during your day out. Take a trip to Lake Wallenpaupack to spend a day on the water! Our sister property, Silver Birches, offers paddleboard, kayak, and canoe rentals. For a little more speed, you can rent one of their power boats. Between the many rentals available at the Recreation Center (which carries a selection of provisions and lake necessities), you’ll find everything you need for a fun time. If you’d prefer to sit back and relax, consider taking a Lake Wallenpaupack boat tour! Wallenpaupack Boat Tours and Rentals offers a 50-minute boat ride, which covers about one-third of the lake. You’ll get a first-class experience, from the gorgeous views to the friendly and knowledgeable guide describing the history of the lake. The boat departs every hour, on the hour. See the Poconos from a different vantage point: on horseback! There are three excellent places for horseback riding in the Pocono Mountains that are just a short drive from Ledges Hotel! Malibu Dude Ranch is expansive, with over 800 acres of trails. They offer guided rides that last about one hour long and are a 40-minute drive from Ledges Hotel. The Triple W Riding Stable, which is about a 15-minute drive from Ledges Hotel, is located in the lake region and offers scenic trail rides. In total, there are three tours from which you can choose. The most popular is the two-hour ride, which takes you through woods and fields up to the top of the mountain. Finally, Happy Trails & Riding Center is a family-owned business that is open year-round. They offer one and two-hour excursions and are willing to customize your experience based on your proficiency. They are about a 15-minute drive from Ledges. For a night at the theater, visit the Bethel Woods Center for the Arts. This cultural facility is part-amphitheater, part-museum, and part-performing arts center, located in Bethel, NY, on the site of the 1969 Woodstock Festival. Today, visitors can see their long-term exhibits as well as their nightly shows. The Bethel Woods Center for the Arts has a wide variety of shows, from comedy to musical performances to films. If you plan on seeing a show, it is recommended that you purchase your tickets well in advance (we suggest that you do it when you reserve your room at Ledges Hotel). If you simply want to tour the museum and the grounds, you should allow about an hour and a half to enjoy everything this wonderful attraction has to offer! It’s about 50 minutes from Ledges Hotel. Treat yourself and your significant other to a relaxing spa day with our Suite Serenity Package. This fantastic special includes a two-night stay in a deluxe suite or our one/two bedroom suite, a couple’s massage at Utopia Salon and Day Spa, a gift basket of spa amenities, wine and a cheese platter in your suite upon entrance, and breakfast for two each morning at The Settlers Inn’s farm-to-table restaurant. You can also add a private yoga class for an additional $50! Hawley is home is to some fantastic dining options, including one at our very own Ledges Hotel! Glass – wine. bar. kitchen specializes in small plates that are meant to be shared. While the menu changes seasonally, you’ll always find classic comfort foods with an upscale twist. Pair your food selections with our All-American wine and beer list, and you’re sure to have a wonderful evening. Plus, you’ll be able to see the gorgeous river gorge falls from the dining room and decks. Glass is open for dinner service from Wednesday to Sunday, starting at 4:30 p.m. The first step to planning romantic getaways in PA is always booking a room at Ledges Hotel. Our modern boutique hotel offers comfortable accommodations with stunning views of the surrounding river gorge falls. Our most elegant and luxurious suite is the Deluxe Full Service Suite, which has two stories with 12-foot ceilings and a spiral staircase. 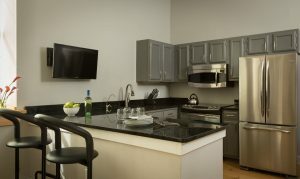 It includes a living space and a fully equipped kitchen that includes a dishwasher, microwave, and fridge. The bedroom, which is on the second floor, features a queen-size bed. The bathroom includes a shower and Jacuzzi tub. This suite also comes with concierge service from the Mill Market at Hawley Silk Mill.